(Bloomberg) -- Brazil will open an office in Jerusalem to handle trade and commerce, said President Jair Bolsonaro, the latest country to open diplomatic representation in the contested city but stopping short of opening a full embassy there. The announcement by Bolsonaro on Sunday during a visit to Israel comes amid a push by Israeli Prime Minister Benjamin Netanyahu to convince other countries to move their embassies to Jerusalem after the U.S. did so in May. Israel and the Palestinians each claim Jerusalem as their capital, and most countries have avoided locating their embassies there until the city’s status is determined. Anything less than a full embassy move by Brazil might be a disappointment for Netanyahu, who’s running for re-election April 9 largely on the strength of his foreign-policy achievements. The election is expected to be close. 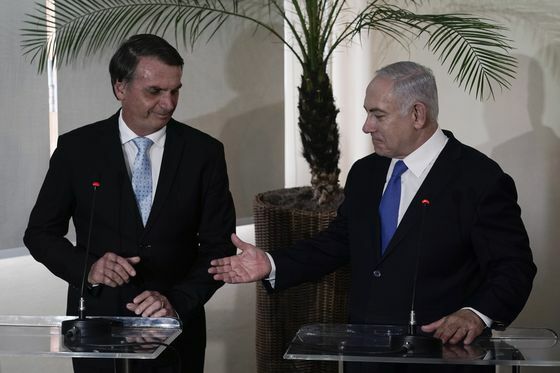 During his 2018 election campaign Bolsonaro pledged to move Brazil’s embassy from Tel Aviv, and Netanyahu said he’d been assured the move was imminent when he attended Bolsonaro’s inauguration at the start of the year. Even so, Netanyahu on Sunday hailed “the dawn of a great era in relations” between the two countries. “We are pleased that after years of relations that were a little hesitant, you have decided -- we decided together -- to open a new era of partnership and cooperation in all areas,” he said. So far only Guatemala has followed the U.S. lead, but a number of countries, including the Czech Republic, Hungary and Slovakia, have recently announced plans to open trade or cultural centers in Jerusalem. Bolsonaro was swept into office in part by Brazil’s evangelicals, who favor stronger ties with Israel and want to see the country’s embassy relocated to Jerusalem. However, the move could harm Brazil’s relations with Arab countries, and especially its exports of halal meat. Brazil has traditionally been strongly pro-Palestinian. In remarks in Jerusalem, Bolsonaro said the new office would promote commerce, investment, technology and innovation. The two countries also signed agreements on a range of fields on Sunday, including defense and cyber security. “I’m sure that our wedding today will bring benefits to our people,” Bolsonaro said, thanking Israel for sending a task force to Brazil in February to search for victims of a dam break in Minas Gerais state. He also thanked the doctors of Albert Einstein Israelite Hospital in Sao Paulo, who operated on him twice after he was stabbed on the campaign trail last year.